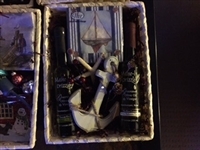 Nautical Themed Basket with Garlic Grating Dish Pasta Anyone! 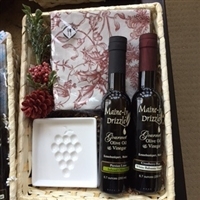 Beautifully packaged basket includes one 6.7 oz Persian Lime Extra Virgin Olive Oil, 6.7 oz Cranberry-Pear White Balsamic Vinegar a Jill Butler Tidbit Plate - an amazing artist has a selection of dipping plates that are sought after, world wide; Fox More Than a Mustard and nice thick pretzels are included for immediate use! 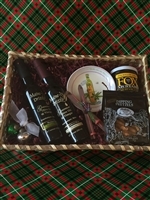 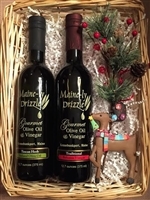 All of these products are packaged in an awesome basket that is sure to please with nice decorative items appropriate for all enjoying the specific time of year. 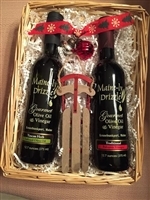 Valentines will be decorated with red items such as hearts etc. 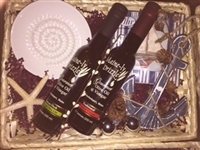 For the sea lover, this basket includes a white garlic grating and dipping dish, 6.7 oz Tuscan Herb Olive Oil and 18 year Aged Traditional Balsamic Vinegar and really nice set of cocktail paper napkins and a oversized anchor ornament.